CHICAGO, CHICAGO, THAT WONDERFUL TOWN…. From June 29 to July 3, 2017 a small but mighty group of Londinsky relatives descended on the Windy City (along with some 30,000 members of the Lions Club International group). However, we made our presence known and had a wonderful time meeting many new-to-us Chicago Cousins, spending time with each other and touring this amazing city. We schmoozed, had a Meet and Greet, heard stories by members of each of our seven branches, had a Shabbat service, and listened to guest speaker Dr. Joshua Shanes on the topic of immigration and we schmoozed some more. We hope you'll plan to join us at the next reunion June, 2019. For information on this, please contact controljfg@aol.com or robftmyers@yahoo.com. Seated on floor (l-r) Jonah Nadler, Bella Nadler, Andy Blaustein, Noam Sternfeld, Susan, Rob, Michael Braun, Howard London, Rachel Reznick, Scott Sternfeld, Trey Cooper. Row 1 - (seated in chairs) Renee Temin (with Ashira in lap), Helene Braun (with Esther Bayla Temin in lap), Sam Bluestein, Shirley Bluestein, Annette Heller, Ellen Nadler, Millie Madoff, George Windecker. Row 2 - standing - Max Pinkus, Luba Grechanik, Alla Londinski, Svetlana Svirsky, Michelle Mufson, Randee Romanoff, Elina Nalibotski, Janice Pinkus, Carol Gorenberg, Dolores Wine, Hilary Olsin-Windecker, Susan Pinkus, Gail Badner, Noni Ammidon. In June of 2015, 90 family members traveled to Washington, DC to learn about the history of our family and our nation. More than 45 family members toured the Holocaust Museum, others saw the Marine Corps Silent Drill team and the Drum and Bugle Corps perform, and many more visited the national monuments and museums and historic sites. At our banquet we heard from Henry Greenbaum, a Holocaust survivor and volunteer at the Holocaust Museum. We also heard wonderful stories from members of each of our seven branches. 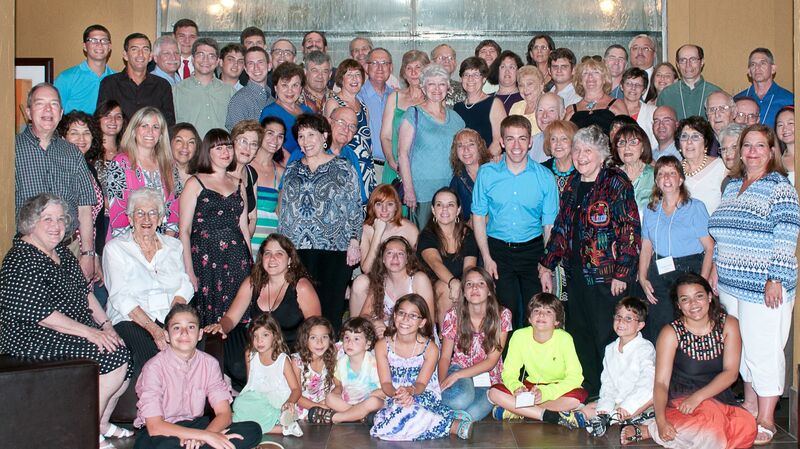 In June of 2013, almost 80 Londinsky family members traveled to sunny South Florida for our 9th reunion. We met in Fort Lauderdale and in addition to spending time at the beach, family members visited many museums, including the Holocaust Museum in Miami. They rode the water taxi and toured the Everglades. However, the best times were spent meeting with other family members in the lobby of the hotel. At our banquet Saturday evening, we sang along with the karaoke machine and danced the night away. 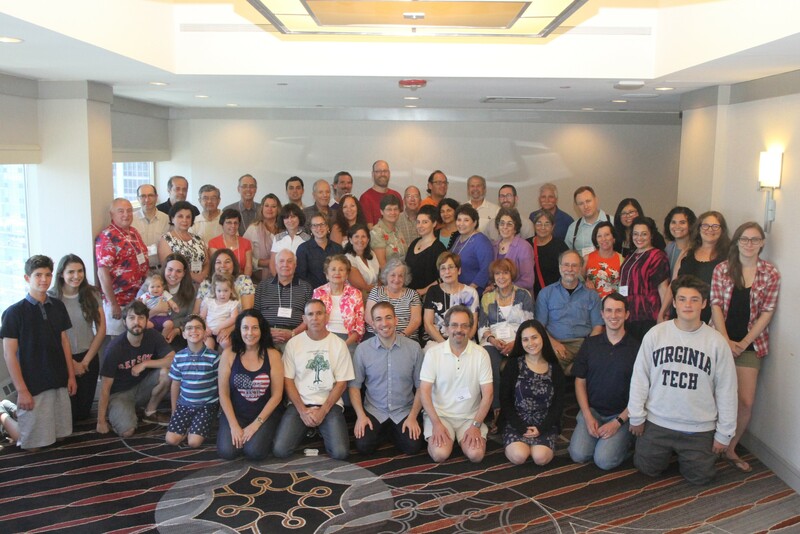 On July 26, 2011, nearly 95 Londinsky family members gathered in Boston, MA for our 8th family reunion. We were joined by several new family members who had been discovered by our family genealogist, Rishy Savin. Alla Londinski, Elina and Boris Nalibotski were thrilled to find new family members and we were thrilled to meet them. Our family spent many hours in the Embassy Suites lobby catching up with each other as well as touring the exciting Boston area. We took walking tours of the historic areas, visited Quincy Market and Faneuil Hall, attended Red Sox games and enjoyed the Boston Children's Museum on one of the days when the temp was above 90 degrees! A great time was had by all. Row 6 l-r- Bodhi Nadler, Al Levine, Maria Moore, Tara Levine, Kevin Levine, Sam Kupelnick, Bob Braun, Mort Hyman, Patrick Day, Linda Heller, Craig Becker. On June 25th, 2009, 56 Londinsky family members traveled to Atlanta, Georgia for our 7th reunion. We were at the Wyndham Peachtree Conference Center, just south of Atlanta. Family members had traveled there from as far away as Buenos Aires, Argentina and London, England, and from as close as Roswell and Marietta, Georgia. Although this reunion was smaller than many of ours in the past, we still had a great time and really got to know one another. We played Londinsky Jeopardy, celebrated Shabbat (and enjoyed the wonderful challahs made by Raina Nadler), toured the city of Atlanta including the Georgia Aquarium, and had our own American Idol karaoke entertainment at the final banquet. Our next reunion will be in Boston, MA during the summer of 2011. Copies of the Londinsky family book are available on CD to anyone who requests a copy. Please contact Ellen Nadler at controljfg@aol.com. You may have thought that Ronald Reagan was the Great Communicator, but you would be wrong, it was my Uncle Bill. When we were younger, we did not see him much, since after finishing college, he started a business in Chillicothe, Illinois, married Sherri and had three kids. Our family was always together for Passover- and for many other family events-either in Quincy, Peoria or St. Louis. However, both he and my Uncle Sam had developed what became known as the FAMILY LETTER. All five of the siblings exchanged letters, often weekly, with each other, with the help of carbon paper (if you’re old enough to remember what that was). It was too expensive to call and we all lived in different cities, with the exception of Aunt Mary and my mom, Esther. Years later, when Uncle Bill and family moved to Miami, we didn’t get to see them often. However, I know that he always wrote to my parents, so they stayed in touch. When the Bar and Bat Mitzvahs and weddings began, our contact became much more frequent. These letters kept us informed of each other’s doings, better than a once a year holiday letter ever could have. They kept a close family even closer. But the glue that did this was Uncle Bill. The computer also opened the world to Uncle Bill in ways some of us would never have expected. First of all were the jokes……….lots and lots of jokes. When Uncle Bill was hospitalized several years ago and during his recovery, the jokes stopped. When they started up again, we knew he was doing better! We even got one just a few weeks before he died. However, Uncle Bill used the computer for more than jokes. He became an on-line math tutor and helped many students master their math homework. He published the newsletter for his temple. I think that most of us would agree, though, that Uncle Bill’s greatest accomplishment in communication was what he did for the Londinsky family. 1930-2009 these were the years of Bill Becker’s life. When you see those dates, you might want to focus on the numbers, but what is even more important is to look at the dash between those years, what his dash was worth. When our mother, Esther (Bill’s Sister) died, he sat at her house gathering information from all of us about our family history. Later, he was able to transmit this information to our distant cousin Eleanor Kessler (in the UK) to complete the family history that she had compiled. Three years later, we held our first Londinsky family reunion. Bill Becker’s tireless efforts to contact everyone brought over 100 family members from all over the World to the Catskill Mountains. At that reunion, he presented us with a booklet containing the names and important information about more than 1000 family members. Over the last 12 years, that small booklet has grown to 89 pages with essays, pictures and updated information. This came about because of his tireless, unselfish efforts to contact people and encourage them to update information and to come to the reunions. Now we are not just cousins, many of us have become friends, from England, to Argentina, to Canada, to Israel and to Italy, we are one family. So today we remember the great communicator and make him a promise. We will continue his work and we will write those family letters. Do you have some news of family members to report or do you have some special event coming up which you would like to have posted here. Then send an email to Ellen Nadler at controljfg@aol.com with your information and it will be added to our web site within days. Think back to some of the stories your parents and grandparents may have told you about the "old days" when they struggled to leave Poland or to make good in their new homes. Please write those remembrances down and share them with us so we might capture in print those memories for our children and grandchildren. We will make those memories part of the Londinsky Family book. Send your memories to controljfg@aol.com or robftmyers@yahoo.com for inclusion in our next family book. The following link will take you to a website of family videos including family history and stories. You can click on the name Family Videos or the image. Please contact controljfg@aol.com or robftmyers@yahoo.com with any questions or comments.